I have CPU i5 2500k @ 3.30 ghz and NVIDIA GPU 770gtx 6gb. The only game I really wanna play is Apex legends. I am getting about 40 fps with low settings ( almost all off in graphics settings). I wonder what would be a cheaper option? Screen Resolution is 1920 x 1080 on 27 inch monitor. Sorry, I am not sure how else I can provide my pc specs. Which exact GPU model is that ? On what screen resolution do you play games ? List FULL PC specs as well. Edit: It looks like you edited your OP. So you have the GTX 770, having 2GB VRAM, not 6 ? This is an old GPU, based on the Kepler architecture. Anyways, any new mid-range GPU upgrade should certainly help, despite your old CPU (assuming it doesn't bottleneck the card). As above, upgrade the GPU as your i5-2500k should still be fine, especially if you overclock it. As for which is cheaper, most likely the GPU as a new CPU will also require a new motherboard and RAM too, plus a new OS key? I have 6gb ram on GPU according to dxdiag. That might be your Total system MEMORY, not the VRAM. It says 2007 MB there. But never use DXDIAG to grab info on the GPU/CPU. Use tools like GPU-Z, MSI AB, Speccy, and other similar apps. Based on your budget, there are quite a few cards which you can go for, mostly mid-range, because a high-end might get bottlenecked by your current CPU. Which camp do you actually prefer, AMD or NVIDIA ? I think the RX 580, GTX 1060, or even the latest Turing GTX 1660 might fit your budget, and these are going to be faster than your GTX 770, if I'm not mistaken. But some models are expensive, others not so pricey. Depends on the brand, and the cooling solution. Let me think more about this issue, since my suggestion might not be fully accurate. Let others guide you further for the time being. I will get back soon with more info, since I need to go for some important work now. I do have full tower fyi and if SSD gives me performance then will buy that too. AMD or Nvidia doesn’t matter to me. Thanks! SSD won't necessarily give you better fps but it'll certainly load everything quicker and well worth the money. I still think GTX1060. The RX570 4GB would also be a good upgrade fitting easily in your budget. in most cases it would be best to get the gpu upgrade and oc the cpu... but games are starting to use extended instruction sets that the older cpu's have to run in software which is slower than running it natively on the hardware. then get a new gpu when you need the fps boost. Thanks everyone for input! 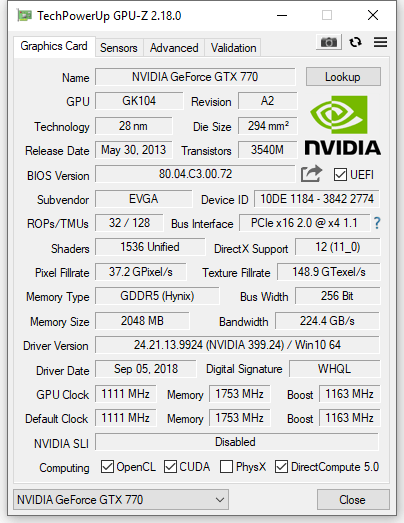 Which brand of 1060 gtx I should consider ? Link may be ? Question Suggestions needed on GPU upgrade. [SOLVED] Worth upgrading from 980ti to 1660ti or 2060?